CNet and others were reporting today that we finally have a release date for the first Microsoft Surface tablets. And out of the gate, Microsoft is releasing the consumer models first. According to reports, the higher end models aimed at business will be released 90 days later. The magic date is apparently October 26th unless something comes up to change that, and this is Microsoft after all. Something could come up. Regardless, Microsoft’s best bet here is not a big holiday splash with consumers. Many others have taken a stab at that consumer market and failed. That’s why it should take a different tack from previous competitors and go after the enterprise market full bore. If it has any hope at all (and I don’t hold out much for either one to be honest), the enterprise is going to be its best bet. That’s because there’s at least a slight opening in that market. Even with Apple finding its way into the enterprise, there are still plenty of IT pros who would be much more comfortable with employees having a Windows machine. Of course, that would assume that IT even has a say in the matter and it’s not clear that’s the case as more and more companies encourage employees to bring their own devices (BYOD). But perhaps, some employees who primarily use Microsoft Office and Outlook and perhaps even SharePoint will find a Microsoft-centric enterprise tablet attractive. Perhaps. How many? Enough maybe to create a small market. It’s hard to know how Microsoft will define success in this space. To cover its bases though, Microsoft announced two distinctly different tablets in June. One was a consumer model, running the ARM processor and Windows RT. 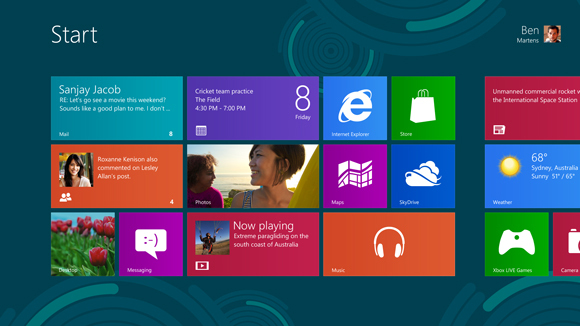 The other was aimed at the enterprise running an Intel processor and Windows 8 Pro. Meanwhile, there has been rampant speculation on Surface pricing with about as much to go on as your typical Apple rumor — in other words, not much. Per usual it hasn’t stopped technology journalists and bloggers from hotly debating about it. Unless, Microsoft plans on pricing these below cost though, chances are the consumer model has to be in the $500 range. This much we have learned from the likes of the RIM Playbook and the HP TouchPad. We’ve also learned that the best price was the $99 HP fire sale price, which briefly made it the number two tablet in the world, but there’s not much chance that Microsoft plans to lose money on these babies. You may recall I wasn’t thrilled with the idea of Microsoft getting into the tablet business. My first post on the matter, Microsoft’s Folly: Trying to Build a Combined PC and Post-PC Device, outlined my initial issues with the announced machines. But even with my general skepticism about these devices, there appears to be a lot of anticipation about them. Of course, we’ve seen this pattern play out before, and we’ve watched as each new contender tried and failed miserably to dent iPads’ market dominance. I seriously doubt, Microsoft has the chops to do much damage, but in my view leading with the consumer product is not the way to maximize its market impact. Time will tell if I’m right.